Scientists have long recognized the human brain appears to keep time to its own internal clock, its biological age speeding or slowing depending on a host of factors. Someone with a higher education, for example, might have a younger-looking brain than someone without one, research has suggested. Surprisingly, dancing appears to keep the brain young. Meditation might do the same. And stress has been associated with an older-appearing brain. Now, a new study led by a University of Florida Institute on Aging researcher has found the brain age of older adults with chronic pain had accelerated by an average of two years. This might have important health implications since previous research has associated accelerated brain aging with an elevated risk of poor mental and physical health, including Alzheimer’s disease. But Cruz-Almeida found that people who received treatments for their pain, from medication to even home remedies like a cold compress on an aching knee, had younger-appearing brains, suggesting that pain relief might slow that internal clock. Meanwhile, individuals without chronic pain had on average a brain that appeared four years younger than their actual age. “Our findings highlight the need to address chronic pain, not just in older individuals but in potentially everyone, as pain may have unintended consequences in the brain that we don’t yet fully understand,” said Cruz-Almeida. The study showed that people with a positive affect — those who have a happier outlook on life and were generally more upbeat, even when they have chronic pain — had younger-appearing brains. “The pain experience is not just in your brain,” said Cruz-Almeida. “It’s related to social, environmental and lifestyle factors” that might be managed to keep the brain young. The study measured the volume of the brain’s gray and white matter in a group of 47 adults, ages 60 to 83, both with and without chronic pain, using magnetic resonance imaging scans. The MRIs essentially measured brain atrophy, which occurs naturally as people age, though with great variability. Study volunteers were free of any neurological disorders and in good health, save for chronic pain in some. Their brain scans were then fed into a machine-learning algorithm, developed by researcher James Cole, Ph.D., at King’s College London, who also is a co-author of Cruz-Almeida’s study. The algorithm is trained to calculate a brain’s biological age based on the loss of brain tissue volume. This algorithm was built using brain scans of 2,646 healthy individuals, ages 18 to 90. In essence, the algorithm recognizes what a brain typically looks like at a specific age in healthy individuals. Cruz-Almeida said it was important to note that there is variability among the 47 older adults whose brains were scanned, including some individuals with chronic pain who actually displayed brain ages younger than their actual age. Cruz-Almeida is embarking on additional research using a larger sample of older adults. This future study also will look at ways to alleviate accelerated aging. More research also is needed to answer a chicken-or-egg conundrum: Does the pain cause the brain to age, or does an older brain heighten someone’s experience of pain? Right now, scientists can’t say. More than 1.5 billion people worldwide suffer from chronic pain. In fact, more Americans are affected by chronic pain than diabetes, heart disease and cancer combined. 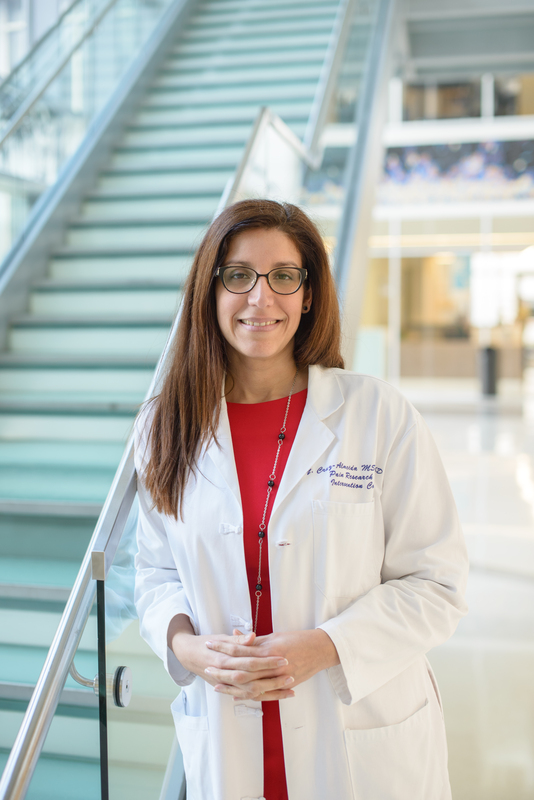 Cruz-Almeida is an assistant professor in the UF College of Medicine’s departments of aging and geriatric research; neuroscience; and epidemiology, which also is in the UF College of Public Health and Health Professions. Cruz-Almeida also serves as associate director of training and career development for the UF Pain Research and Intervention Center of Excellence and as leader of the pilot and exploratory studies core of the UF Claude D. Pepper Older American Independence Center. Co-authors of the study include Roger B. Fillingim, Ph.D., a professor and director of the UF Pain Research and Intervention Center of Excellence and a member of the UF Institute on Aging; Joseph L. Riley III, Ph.D., director of the pain clinical research unit in the UF Pain Research and Intervention Center of Excellence and a member of the UF Institute on Aging; Adam J. Woods, Ph.D., an assistant professor in the UF College of Public Health and Health Professions’ department of clinical and health psychology and the UF College of Medicine’s department of neuroscience; Eric Porges, Ph.D., an assistant professor in the UF College of Public Health and Health Professions’ department of clinical and health psychology; and Ronald Cohen, Ph.D., a professor in the UF College of Public Health and Health Professions’ department of clinical and health psychology and director of the UF Center for Cognitive Aging and Memory.